A gorgeous table lamp with various colors in the base and a soft teal blue lamp shade. This fun table lamp is a twist on traditional stacked glass lamp designs. The lamp's design features jewel-like pieces of glass in shades of pink, orange, purple, green and yellow stacked one on top of the other, separated by silver finish accents. The teal blue glass base perfectly complements the matching bell shade. Overall: 21" high. Shade is 5" across the top x 9" across the bottom x 9" high. Uses one maximum 60 watt standard-medium base bulb (not included). On-off switch on socket. Glass table lamp base. A fanciful contemporary look from 360 Lighting. Teal blue bell lamp shade. 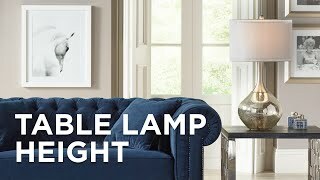 I have purchased several lamps recently from Lamps Plus and have been delighted with them all. This one will be lovely in my grandchildren’s colorful Teal bedroom. HIPPY STYLE MY MOM PICKED THIS OUT. This is a colorful lamp which is good for my granddaughter's bedroom. She will love it! Fun colors to compliment a multi-colored bedspread. 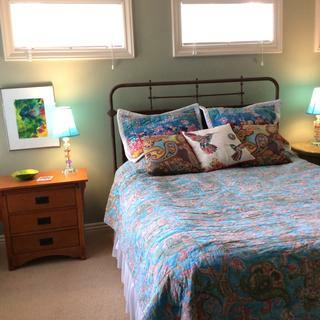 I like the multi-colors, it works well with the bedspread. I chose this lamp because of the style and color. The lamp is for my 8 year old granddaughter who loves to read and loves teal. I thought it was different. Very cute. And, the reviews on it was great. Can't wait until it arrives. 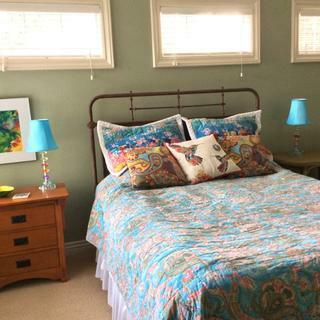 I redid a guest bedroom in a coastal decor with soft blues and sage greens. I have been looking for a set of turquoise lamps for the dresser which would make the sage green walls pop and I think these will do it. I'm tired of white lamp shades and so I chose these. Hope it works out. Just love the color and style. The colors attracted me. I have a comforter with similar colors. Love the color for my guest room! Because they are pretty and fanciful and I think will go perfectly with the bright colors in the paintings of the room I want them for as bedside table lamps. Looks so fun and pretty! Is this blue a true blue or more a shade of teal or turquoise ? BEST ANSWER: Hi - to our eyes this is a shade of turquoise. It is not a true blue. It's not a true blue but more of a teal/ turquoise. It is more of a teal - definitely not a true blue. I think it is more blue, blue. I so love this small lamp with beautiful glass crystals on stem. 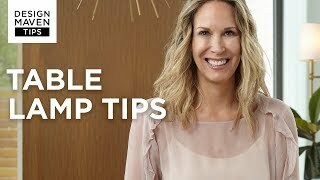 It is perfect for my vanity area to enchant & decorate the small space. It looks good on my desk or in bedroom also, so may purchase more. Love it. Got this lamp for my daughter's room to put on her bedside table. It looks perfect and the fact that it's multicolored is fun, and really picks up the colors in her room. It's on the smaller side, so works well in proportion to the table and room. The light is soft, but bright enough to read by. The only reason I didn't give it 5 stars is that the stacked glass on the base is a slightly crooked, but not enough to warrant returning it. She loves her lamp with "jewels" on it. It's a fun and affordable addition to the room (and really goes well with a "Frozen" theme, or really any feminine decor). I'd highly recommend it. The lamp arrived quickly and well packaged, but the light switch was bent down and the supports inside of the lamp shade were crooked. I was able to straighten them both out, and so I did not need to exchange the lamp. This lamp is so beautiful. Well made and looks fantastic!! 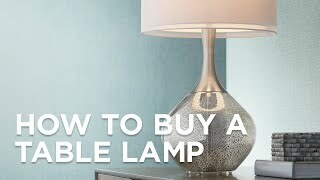 I would recommend this lamp 100%. Love it! It goes perfect with my daughters bedding! Ordered this lamp for my granddaughter’s bedroom. It has all the colors she loves. Very pretty and cheerful lamp. I love it myself. Would definitely recommend it. Everyone who walks into my renovated office, notices these lamps immediately - "how pretty," "so unique," etc. I love them. Love these lamps. The colored glass picks up all the colors in our decor. I couldn’t be happier. They arrived with LED bulbs which provide just the right amount of light for reading. Thank you! love this lamp! 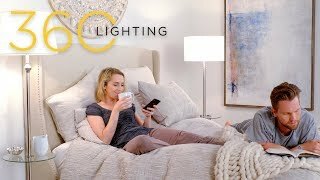 if you want to jazz up your bedroom this ia the lamp for you! I think the lamp is very pretty, especially for a little girls room. My only issue with it is the base is not near as blue as it appears in the picture. It is almost clear with just a blue tint. Got this tabletop lamp for my granddaughter's desk. She loved it. She was so excited to turn it on...all the grown ups agreed- it was a cute, colorful, and not just an ordinary lamp. This clear glass table lamp features a bold drum shade with an exclusive Blue Tiffany-Style Silver Metallic giclee printed pattern. A tapered shape adds visual intrigue to this stunning glass table lamp set with a champagne finish and taupe drum shade. A dynamic blend of monotone hues with soft metal accents bring style and beauty to this contemporary glass table lamp. 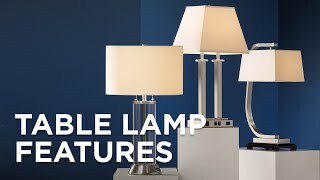 This blue lattice table lamp features a white drum shade and an easy reach switch for functional style.